The ceremonial start is going on now, and actual racing starts Sunday at 2:00 pm, Eastern Time (10:00 am in Alaska). Typically the restart, as it is called, leaves from Willow, but poor conditions there have moved it to Fairbanks. The race lasts 9 – 12 days, ending when the last team makes it to the burled arch in Nome. The mushers leave at 2-minute intervals in a staggered start that keeps the dogs and sleds from getting tangled with each other. The time is made up by adding time to the 24-hour mandatory rest period. 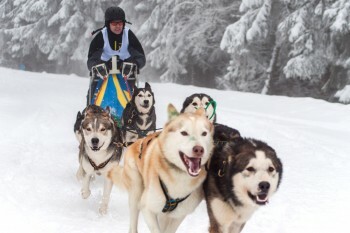 Every musher has to add two minutes to the rest period for every person that left after him or her. The first of the 67 mushers to leave Nome, Cody Strathe wearing Bib # 2, adds 134 minutes to his required rest period because he gets to start 134 minutes before Hugh Neff wearing Bib # 68, who takes only the required 24-hour rest period. A live feed of the ceremonial start is currently running on the Iditarod site. I’m not sure how long free live coverage continues, so check it out soon!